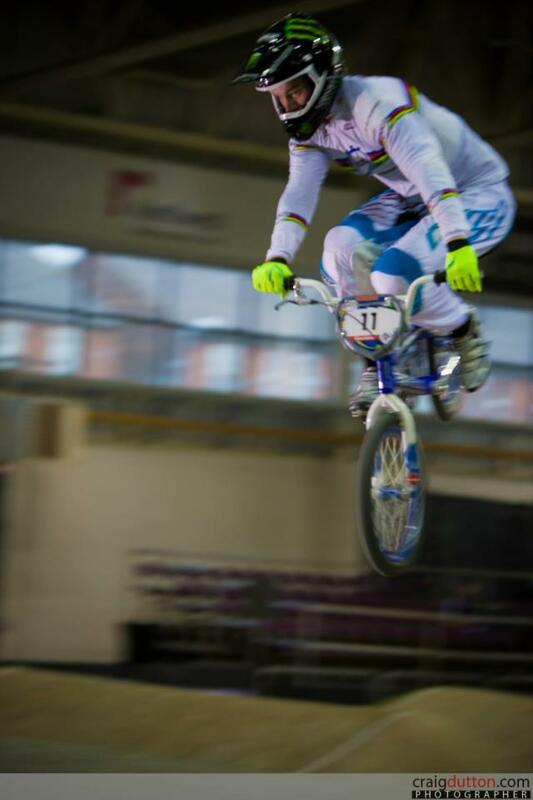 Round #1 of the 2013 UCI BMX Supercross World Cup tour series took to the incredible indoor BMX Supercross facility at the British National Cycling Center in Manchester, UK. This indoor SX track set up is World Class and the perfect place for the 2013 season to kick things off! 160 of the worlds top Elite Men from 26 different countries took to the Manchester track in the Time Trial run, to not only whittle the field down to the top 64 that move on to the race program on Saturday night, but the top 16 would then ride a 2nd lap in the Super Final Time Trial. Connor Fields has been one of the most consistent riders at the UCI SX series events, taking a handful of wins last season. Heading into 2013, Connor has been riding strong on the USA BMX event series and was looking to carry that momentum into the UCI SX series. As the TT kicked off, Connor would be one of the last riders to take to the track, to try and beat the times of the other riders. The riders would produce some fast laps on the Manchester track, and the top 16 times would be incredibly close. Connor would finish up 6th in the Time Trail, pushing him through to the Super Finals run. Here are the times for the top 16 riders, that all moved on. The Super Finals 2nd run of the top 16 from the Time Trails were once again a ultra tight battle for the top 16 riders of the days TT. Not only would the 2nd run determine the winer os the days time trials, but the riders also use the result top determine the order in which they get to choose there gate pick for the start of the racing action the following day. Things would heat up early, as Sam Willoughby would have a super fast run going thru the first split time zone, but quickly things turned bad, as a slight bobble created an frightening ejection, but Sam would be able to safely run out of the crash, and ride off the track and gather himself together for racing on Saturday night. As Connor would line up in the gate for his run Edzus Treimanis had the fastest time clocked in the quickest time of the night with a 29.596. Connor had a quick lap on the track and just a slight tap of his rear wheel down the last straight away, but his time was fast enough to tie Edzus time to the exact 100th of a second! Both Connor and Edzus would occupy the Hot Seat with the quickest time of the night, until Tory Nyhaugs run. The last rider to go would be Liam Phillips and his super fast run would edge out the entire group of 16 riders taking the overall win. Connor would place 3rd, as the tie breaker would be the result of the original TT run. Here are the top 3 times in the Super Final. Racing action will start at 7pm local time in Manchester. It will be some ultra tight and fast race action for the Elite Men and Women on the Manchester track. 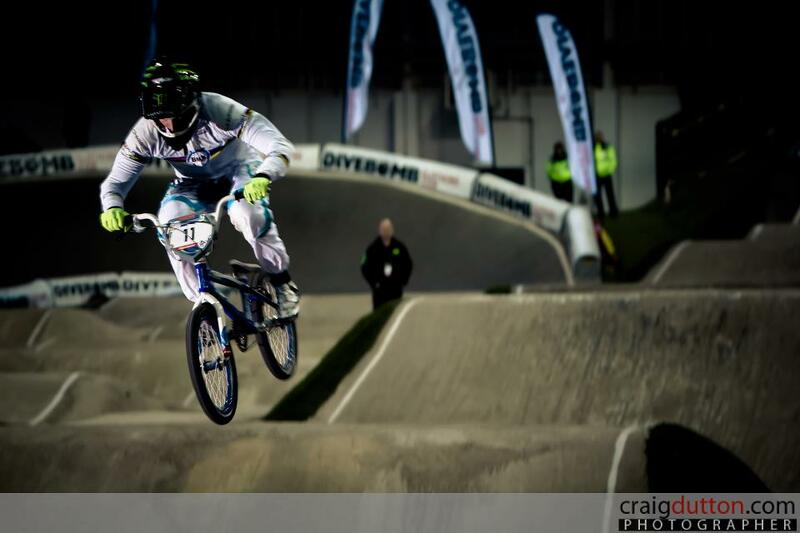 You can catch all the racing action live on www.BMXlive.tv and cheer on Connor as he goes for the win in tonight race.